Home > Eating Disorders & the Elderly > Eating Disorders and Dementia. Eating disorders do not solely occur in those who want to lose weight or have distorted body image as they can just as easily occur in the elderly especially those who have dementia. 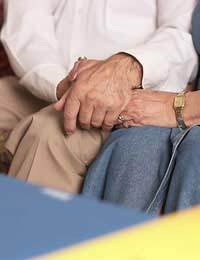 Not only might the dementia cause them to forget to eat, but they may not be able to make their own meals, do their shopping or safely prepare a meal and these reasons are often overlooked, even by caring family members as they do not realise that this is a problem. When someone is first diagnosed with an illness such as dementia it can be very easy to spend most of the time worrying about their physical health, mental well-being and their safety; often the person’s basic needs are overlooked. Issues such as hygiene and nutrition are not commonly on the top of the list of concerns and in actual fact these are often the most important. Noticing when they might be an issue is extremely important in preventing long term health problems relating to poor nutrition. Ask yourself questions such as has the person’s kitchen been used recently? Have they lost any weight without intention in recent weeks? Is there any food in the cupboards? Have they mentioned going shopping or feeling hungry lately? They may seem like basic questions but they are extremely relevant and may reveal a developing problem. Obviously, as with any mental health issue, it is important not to take each answer for its face value, and observation or digging a little deeper can reveal some very worthy information; it may take extra time, but in the long term, many other problems can be prevented. If you have established that a problem may exist, speak to your GP, relevant healthcare professional or Social Services for advice on how to combat the problem, alternatively find ways of preventing the problem yourself if possible. It might be easy to assume that the person looking after someone with dementia should prepare all the meals for them, serve them and sit with them whilst they have their meal, but in the early stages this may not be what the person with dementia would want.Instead it may be far more productive to help them plan their shopping, take them to the shops and provide assistance when preparing the meal. It may be something as simple as making sure that the person turns the oven on and off or helping them write a plan for the week’s meals. The person may be very capable in the initial stages of the illness in cooking the food and eating it and will not be particularly grateful if someone else interferes with their routine, especially if they are otherwise independent. It may be more helpful to provide them with the tools they need to make sure they eat properly rather than actually doing it for them. Obviously as the illness progresses they are likely to need more help and it is at this time it may be beneficial to invite them over for a meal or arrange adequate assistance such as meals on wheels if needed. This can be expensive so make sure you are aware of entitlements regarding funding of these services. Dementia and other similar illnesses can develop very slowly in some cases and it is often the fundamental elements of living that are neglected first. Those around should be able to notice or express concern and intervene when these issues become apparent and find help when necessary.